The 2018 Kansas high school football season kicked off with nine ranked teams losing in Week 1. Since several of those teams lost to other ranked teams, the impact on the Kpreps poll isn’t quite a significant as many might think. Let’s take a look at the Kpreps Top 5 to see what changed after the first week. Derby remains atop the Class 6A poll after a 49-6 victory over Garden City. Hunter Igo returned the game’s opening kickoff for a touchdown and the Panthers rolled from there. Derby takes on Ark Valley Chisholm Trail League rival Salina Central this week. Lawrence Free State spoiled the varsity debut of Olathe West with a 41-0 shutout. The Firebirds scored 27 points in the first quarter as quarterback Malik Berry connected with Kansas State commit Keenan Garber on three touchdowns passes. Free State continues its Olathe tour this week by hosting Olathe East. Blue Valley and Blue Valley North remain ranked No. 3 and No. 4, respectively, despite losses in Week 1. Blue Valley dropped a 30-14 decision at Class 5A No. 2 St. Thomas Aquinas. The Tigers trailed 21-14 until the fourth quarter when Aquinas kicked a field goal, then added a late touchdown. Blue Valley North lost to Class 4A No. 1 Bishop Miege, 33-21. The Mustangs led Miege 14-13 in the second quarter before the Stags scored three consecutive touchdowns. While our voters didn’t penalize the Tigers and Mustangs for losing, the two will meet on the field at Blue Valley in Week 2. Olathe North enters the poll at No. 5 after the Eagles ran past rival Olathe East, 49-20. The Eagles rushed for 478 yards in the game including 192 yards from Daymonn Sanchez and 133 yards from Arland Bruce, IV. Olathe North replaces Shawnee Mission East in the poll after the Lancers fell 28-23 to Gardner-Edgerton. Wichita Northwest remains in the top spot this week after a thrilling victory over No. 3 Bishop Carroll. Sophomore Carson Arndt kicked a game-winning 20-yard field goal on the final play of the game to give the Grizzlies to a 23-22 win over the Golden Eagles. It marks the second consecutive season the Grizzlies and Golden Eagles took a game down to the wire to open the season. In the 2017 season-opener, Bishop Carroll scored in the final 15 seconds to beat Northwest 40-35. St. Thomas Aquinas remains at No. 2 this week after beating Class 6A No. 3 Blue Valley, 30-14. Aquinas was led by sophomore back Tyron “Tank” Young who rushed for 256 yards and two touchdowns. Aquinas led 21-14 at the half, then added a field goal and a touchdown in the fourth quarter to put the game away. Friday’s opener couldn’t have started any better for Mill Valley as the Jaguar defense recovered a Blue Valley West fumble for a touchdown on the first play from scrimmage. New quarterback Jordan Preston tossed a pair of touchdowns as Mill Valley outlasted their Jaguar counterparts 35-24. Fifth-ranked Maize was impressive in a season-opening 49-0 shutout of Valley Center. The Eagles scored four times in the first quarter and led 35-0 at halftime. Eagle quarterback Caleb Grill, a Division I basketball recruit, passed for nearly 250 yards and three touchdowns. Wichita Heights remains just outside the top five and only a few votes behind Maize for the fifth spot. Bishop Miege won the battle of defending state champions by beating Blue Valley North, 33-21. The Stag defense pressured Mustang quarterback Graham Mertz into three interceptions. Brison Cobbins led Miege with a 202-yard, 3-touchdown night as the Stags won their 26th consecutive game. McPherson remains in the No. 2 spot after opening with a 21-0 shutout of Salina South. Despite graduating eight starters off of last season’s dominating defense, the Bullpups held the Cougars scoreless and under 90 yards of total offense. Pittsburg and Goddard switch places in the poll this week. The Purple Dragons come in at No. 3 in this week’s poll after a dominating 43-8 victory over last week’s No. 5 team, Labette County. Meanwhile, Goddard controlled their opener by beating Wichita East, 32-8. Finally, Paola checks in at No. 5 this week. The Panthers welcomed Bonner Springs to the Frontier League by beating the Braves, 41-0. Paola will host Fort Scott this week. Andale remains atop the Class 3A poll this week after a 42-14 victory over Mulvane. The Indians led 21-0 at halftime and never allowed the Wildcats to get any closer than three scores. Defending 3A champion Sabetha is closing in on Andale in the top spot. The Bluejays beat rival Nemaha Central, 33-7 to open the season. Sabetha’s win ended a streak of nine consecutive regular-season losses to the Thunder. Scott City remains at No. 3 after opening the season with a 35-0 shutout of Hugoton. The game was called late in the third quarter due to lightning. Wyatt Hayes led Scott City with more than 220 rushing yards and three touchdowns. Pratt leaps into the No. 4 spot this week after a dominating 34-0 victory at Hoisington. It’s the second consecutive season the Greenbacks have won at Hoisington. The Cardinals entered the season as the fifth ranked team in Class 2A. Pratt replaces fellow Central Kansas League rival Hesston which fell from the poll despite a 42-36 victory over Hillsboro. The Swathers, who sit just outside the poll, played without senior quarterback Cameron Cox due to an injury suffered in practice earlier in the week. Topeka Hayden again rounds out the Top 5 at No. 5 this week. The Wildcats had little trouble in a 55-3 victory over Topeka West. 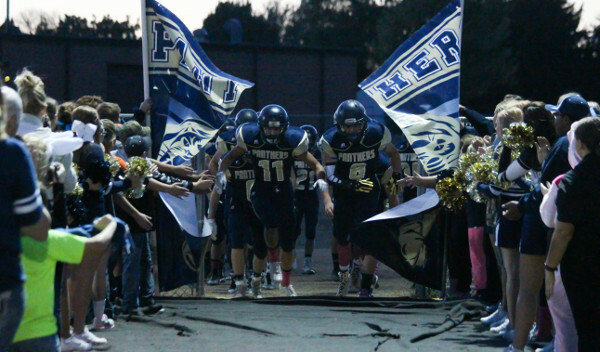 Hayden will take on Centennial League rival Topeka Seaman this week. Voting in the Class 2A poll continues to tighten up at the top. Phillipsburg retains the top spot this week, just one point ahead of No. 2 Conway Springs. The Panthers rolled to a 52-12 win over Ellis, while Conway Springs handled Wichita Trinity, 48-7. Silver Lake retains the No. 3 spot in the poll ahead of this week’s War on 24 against rival Rossville. The Eagles opened the season with a 46-7 victory over Mid-East League rival St. Marys. Garden Plain enters the poll this week at No. 4. The Owls scored on a John Nowak touchdown run and two-point conversion in the final 50 seconds to beat rival Cheney, 15-12. Chaparral is the third Central Plains League team ranked in this week’s poll. The Roadrunners come in at No. 5 this week after a 49-23 win over new CPL member Kingman. Chaparral quarterback Jake Burke put up more than 220 yards of total offense and five total touchdowns in the win. Nemaha Central, ranked fourth in last week’s poll, drops just outside the top five after their 33-7 loss to Class 3A No. 2 Sabetha. Smith Center picked up right where the Redmen left off last season. The Redmen rolled to a 45-0 shutout of Thomas More Prep at Fort Hays State’s Lewis Field Stadium. Smith Center allowed only two first downs and held TMP to negative yardage. Last week’s No. 2 team, Centralia, dropped a 26-14 decision to Rossville. The Panthers led Rossville 14-13 until the Bulldawgs pushed across a pair of fourth-quarter touchdowns. Centralia falls out of this week’s poll and St. Mary’s Colgan moves up one spot to No. 2. The Colgan Panthers ended a string of five consecutive losses to Columbus by dominating the Titans, 40-6. Colgan rushed for more than 300 yards in the game and held Columbus scoreless until the game’s final play. Elkhart moves up one spot to No. 3 this week after defeating Hi-Plains League rival Cimarron. The Wildcats beat the Bluejays 27-20 in a game that was called final with 11:30 remaining in the fourth quarter due to continued lightning delay. Senior quarterback Lane Whisennand accounted for three of Elkhart’s four touchdowns in the game. Plainville enters the poll at No. 4 this week after the Cardinals’ 31-14 victory over Norton. Quarterback Jordan Finnesy passed for 178 yards and three touchdowns, rushed for 88 more yards, and returned an interception for another score. Plainville travels to Class 2A No. 1 Phillipsburg this week. Finally, Olpe opened the season with a 40-0 shutout of Osawatomie. Blaine Hinrichs and Kynden Robert combined for six touchdowns as the Eagles rushed for more than 300 yards. In Class 8-Man, Division I, defending champion Hoxie opened the season with a 44-18 victory over Tribune-Greeley County. Quarterback Jared Kennedy amassed 241 yards of total offense and five total touchdowns. Hoxie will host Osborne, the No. 2 ranked team in 8-Man, Division II. Central Plains scored twice in the final five minutes to defeat Central Prairie League rival Ness City, 30-14. The Oilers will now take on No. 3 Victoria in another CPL battle. The Knights survived a Week 1 test with a 28-14 victory over an Otis-Bison team ranked in 8-Man, Division II. Fourth-ranked Hodgeman County opened with a 38-12 victory over Dighton in another game that was called early due to weather. The Longhorns and Hornets played into the third quarter before the game was called. Hodgeman County now has a road test at Medicine Lodge. The Indians are in 8-Man football for the first time this season and opened with a 60-14 victory over St. John. Finally, Solomon rounds out the poll at No. 5. The Gorillas rolled to a 46-0 halftime victory over Rural Vista on Friday. Solomon is followed by several good teams right outside the poll including South Central, Clifton-Clyde, Spearville, and Burlingame. Defending champion Hanover opened with a 46-0 victory over Pike Valley. The Wildcats had defeated Pike Valley in the state semifinals in each of the past two seasons. The victory is Hanover’s 26th consecutive, tied for the state’s longest current streak with Bishop Miege. Osborne remains at No. 2 in this week’s poll after surviving a shoot out with Hill City. The Bulldogs outlasted the Ringnecks 88-76 thanks to a monster night from senior quarterback Darnell Holloway. Holloway rushed for 356 yards and seven touchdowns, and passed for 94 yards and another score. Osborne travels to 8-Man, Division I No. 1 Hoxie this week. Mankato-Rock Hills stays in the No. 3 spot without even taking the field. The Grizzlies Week 1 scheduled opponent, Blue Valley Randolph, forfeited the game early in the week citing a lack of numbers. Rock Hills will now open the season this week at Lakeside-Downs. South Barber takes over the No. 4 spot in this week’s poll with Otis-Bison dropping one spot to No. 5. The Chieftains picked up an out-of-state win over Cherokee (Okla.), 46-26. Meanwhile, Otis-Bison dropped its opener to 8-Man, Division I No. 3 Victoria, 28-14. Cougar quarterback Anton Foust struggled with cramping the entire first half and did not return to play in the second half. Otis-Bison begins district play this week against Bucklin.